(1) David Weidner wrote an article critical of the gold standard. Another problem is that rather than try to improve our currency systems, we keep going back to this 600 B.C. technology that’s a step up from seashells. 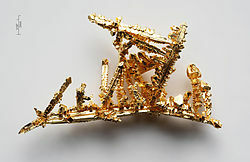 Gold is pretty, but it’s just a piece of metal. Its uses are limited. It can be dug out of the ground. In other words, it’s really all about human confidence that gold is worth something. And, you know, the earth is flat too…. A big problem is that the gold standard never works. It’s like getting back together with that old girlfriend. Your memories of how good it used to be are tainted by your current pain of loneliness. I get it. The pull is very, very tempting. But haven’t we gone down that road enough already? (3) Weidner probably never expected this insignificant, phoned-in piece of inanity to be subjected to withering ridicule and refutation, point by point. A refutation so thorough that it even smashes his clumsy efforts at humor (e.g., contrary to popular belief, and as I myself have pointed out, essentially no one believed the earth was flat). (4) But such a refutation was indeed written, and as a result Weidner now looks like a fool. We can hope that next time he’ll think a teensy bit more deeply before reflexively and predictably aping the conventional wisdom. Either way, enjoy.